Biosurfactants Market size was over USD 1.85 billion in 2017 and industry expects consumption at over 540 kilo tons by 2024. 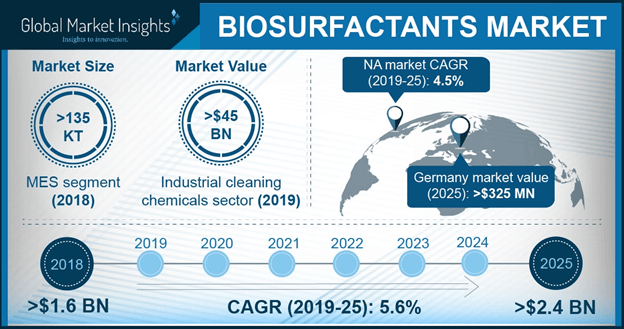 Increasing market demand for personal care, household detergents, oilfield chemicals and industrial cleaners should boost biosurfactants market demand. These are the natural compounds which are used in cosmetic product formulation owing to its biodegradability characteristics. It is widely applied to various ranges of skincare products, from oil-based creams to lightweight emulsions and lotions. Global personal care market size was estimated at over 13 billion in 2017 and is projected to grow at a higher value in the foreseeable timeframe. China cosmetic spending with a market share for over 70% of the total personal care market in 2017. Biosurfactants are the natural compounds with great potential in the formulation of cosmetic products owing to their biodegradability, quick absorption and lubrication properties which makes them suitable for personal care application, thereby increasing product demand. Rising demand for sustainable products in various cleaning applications is anticipated to boost the demand for biosurfactants over the forecast timeframe. Increasing demand for various ingredients from formulators will drive industry cleaning market size which reduces input cost for formulators by 10% to 15%. The product has superior properties which includes bio-degradable, non-toxicity and excellent foaming activity, which is ideally used in hand soaps, facial cleansers, oral care products and shampoos. Biosurfactants are used in adherence to control pollution and create consumer awareness for usage of bio-based products. Additionally, they are highly biodegradable and have longer shelf life compared to its counterparts. High sustainability and low toxicity associated to petroleum-based substitutes coupled with strict regulations pertaining to the usage of bio-based products and dipping the practice of petroleum-based products will favor industry growth. The manufacturing process is still incomplete without a cost-effective and efficient means for downstream processing, even if the optimum production has been attained through cultural conditions and optimal media. The downstream processing costs accounts for over 60% of the total production cost of biosurfactants, which is too high, thus impacting biosurfactants market price trend. Rhamnolipids biosurfactants market demand was valued at over USD 11.1 million in 2017. These are biological surfactants featuring low toxicity, high biodegradability and environmentally friendly characteristics. They are having a wide range of applications in agricultural chemicals, hydrocarbon recovery and oil tank cleaning and household & personal care products. Rhamnolipids from food processing application may surpass USD 1.8 million by 2024. They are used food additives and coloring which improves the texture and creaminess of dairy products, thereby stimulating biosurfactants product demand. Sophorolipids biosurfactants market demand may register gains at about 6.5% by 2024. These are formed by fermentation of various non-pathogenic yeast species which provides stability in wide ranges of pH. Sophorolipids are widely used in skin care items and may register significant market share over the projected timespan as they promote the metabolism of fibroblast and collagen synthesis in dermis of skin which acts as an agent that restructures and tones up skin. It acts as activator of macrophages and healing agent in treatment of wounds & brown spots. Furthermore, their bactericides and bacteriostatic properties play role of controlling dandruff, acne treatment and as an active ingredient in deodorants, which in turn will foster industry growth. Methyl ester sulfonates biosurfactants market size may surpass USD 890 million during the forecast period. It offers wide application in petrochemicals, agricultural, personal care and household industries owing to its superior properties including excellent biodegradability, good detergency, and improved calcium hardness tolerance. MES from industrial cleaners application may register growth at over 3.5% by the end of forecast period owing to its superior properties such as better detergency in hard waters, readily biodegradable, superior detergency at low concentration and compatible with application of builders and enzymes which will boost biosurfactants market demand. North America biosurfactants market size driven by the U.S. may register significant growth at over 4% up to 2024. Rise in per capita income and expenditure on personal care products and consumer goods will propel the industry growth in the region. Increasing demand for cosmetic & personal care products like shampoos, lipsticks, mascara, toothpaste and contact lens solution owing to their foaming, emulsification, spreading and wetting properties will drive regional industry growth. Europe driven by UK, France, Spain and Germany biosurfactants market demand may surpass USD 1.2 billion by 2024. Increasing demand for environmentally friendly products and rising health awareness among consumers is the major driver for product growth. Moreover, ecological protection policies and rising health awareness may enhance product demand over the forecast timeframe. 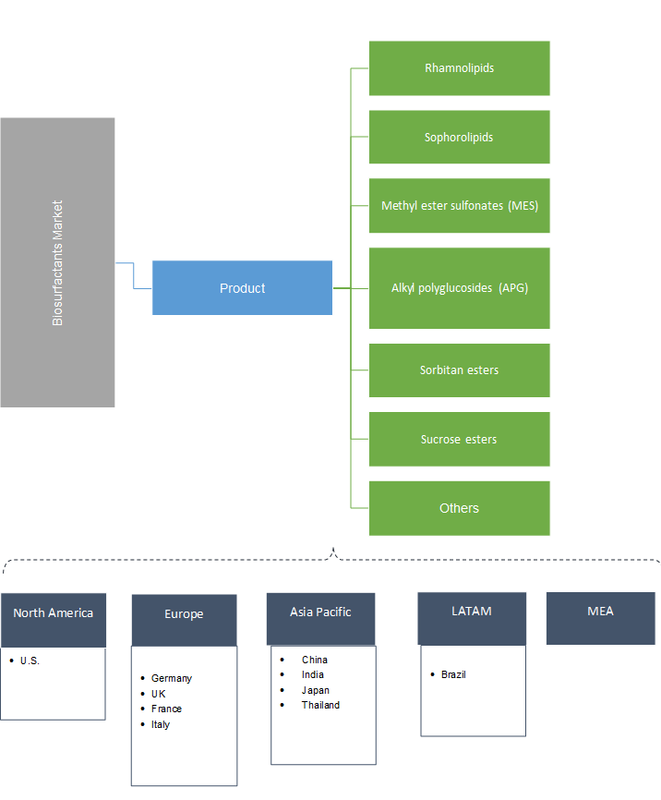 Asia Pacific biosurfactants market demand led by India, Japan and China is likely to register significant gains at over 4.5% by the projected timeframe. Rapid increase of affluence and per-capita disposable incomes in China, India, Thailand, and South Korea, accompanied with demand from household and personal care segments will accelerate product demand. Global biosurfactants market share is fragmented with companies such as BASF, AkzoNobel, Evonik, Ecover and Jenil Biotech. The companies are involved in joint ventures and merger & acquisition to inflate their product portfolio and expand their global presence. Furthermore, the industrial participants are concentrating to produce eco-friendly products to boost the overall industry growth. Biosurfactants are surface active biomolecules which are manufactured from several microorganisms and could minimize the surface and interfacial tension between two immiscible fluids phases. They have added value in biomedical, pharmaceutical, cosmetic, food processing and oil & gas industries as it is highly biodegradable and low toxic. It offers widespread application scope in personal care industries owing to foaming and wetting properties. They are excellent emulsifiers and possess skin compatibility compared to other synthetic surfactants, which offers growth prospects in the market.